Travel with me now gentle reader and I will explain to you why some believe that the greatest act of genocide in human history is currently being attempted, and how that act may already well on its way to being achieved. Deliberately inflicting on the targeted group conditions of life, calculated to bring about its physical destruction in whole or in part. Bearing the points above in mind I invite you to consider where we, the native peoples of Europe have been brought to, in particular over the 65 years since the guns fell silent at the end of a war which our grandfathers were told they were fighting in order to save the future for their children. Far from saving the future for their children, I would suggest to you that, since World War II, conditions of life have been introduced by those who hold power over us which are calculated to bring about the destruction, at the very least in part, of those very children, the native people of Europe. Meanwhile measures have been introduced intended to significantly reduce the number of Native European births. A victim will the more willingly drink his poison if its made to taste sweet, and what was sweeter than a sexual revolution without the inconvenience of pregnancy. Forms of contraception have existed with varying degrees of effectiveness for hundreds of years, but never before has it been so easy to avoid getting pregnant. Many will argue that the avoidance of an unwanted pregnancy is beneficial, they will point to the shame and social exclusion of unwed mothers in the past, to prematurely aged women brought to early graves by repeated child bearing, to the financial burden which large families can cause and of course they are correct in some degree, albeit certainly not in the numbers they inevitably claim. I will not deny that effective, and easily accessible, contraception has benefits for individuals, however, millions of indigenous European children, whom nature intended to be conceived, have not been conceived as a direct result of the contraceptive pill, and the benefits, if any, of that loss to us collectively as European people are less easy to quantify. As I type this I can already hear the shrill squawks of derision from the trolls and intellectual pygmies at forums such as fstdt.net, who monitor this blog from time to time, and, no doubt, some more grown up readers will raise a sceptical eye-brow at the linkage of oral contraception to genocide. However, I would ask you to put your prejudice to one side and consider these things in context. This is but one aspect of many and, when so many coincidences lead in one direction it is hard to ignore a design. The contraceptive pill, initially available to married women as a means of family planning, is now celebrated as a weapon of female liberation and heavily promoted within white western nations. It is, of course, also a means of not having children in the numbers which any race needs in order to survive. Again as with contraception, abortion is portrayed as both a right and a further means of liberating women, in fact it is implied that to be opposed to abortion is to be anti-women. Indeed, popular culture regularly depicts those who are pro-life as being evil or unbalanced, meanwhile, people who are pro-choice/pro-death are portrayed as decent, rational and even rather heroic. As we all know when the media resort to propaganda, they have an agenda. Is it just coincidence that the two greatest social changes, effecting human reproduction, in the second half of the 20th Century resulted in tens of millions of western children not being born? If so, then here is another coincidence. There are, of course, other, less obvious ways of preventing births than merely preventing conception or by killing foetuses, you need only create an environment which discourages the target group from reproducing. As a result of successive deliberate economic policies during exactly the same historical period during which the changes described above were taking place, the vast majority of women are now forced to work, rather than stay at home and raise families. They are, of course, told that being away from home anything up to twelve or more hours a day (and for most of us remote linking or bringing work home at night) is liberating, whereas, in fact, they have no option. What has changed? It has far less to do with social attitudes than it has with the new economic reality. As recently as the 1960’s the average man’s take home pay was sufficient to support his home and his family, which was, on average, larger than a modern western family. That is no longer possible for anyone under executive level and only then if the husband commutes for hours each day. This didn’t happen by accident, it didn’t happen due to natural progression, it was the result of deliberate political acts and government policy. For instance, one of the reasons why men’s wages have not kept pace with the cost of maintaining a home and family is mass immigration, which has been cynically used to depress wages. A recent study (2) in America estimated that by pushing down wages, immigration triggers a substantial redistribution of income from native-born workers to native-born owners of capital. It was calculated that this redistribution amounts to about 2 percent of GDP, or a whopping $250 billion annually at current levels. And it is the native elites who gain this sum at the expense of native workers, whose wages are kept artificially low. Read the rest at Sarah’s Albion Blog. 10. placing the Palestinian problem at the center of international politics. 11. delegitimization of Israel with all the negative characteristics that follow. All of these themes, none of which are found in the 1967 UN Security Council Resolution Number 242, were developed by the European Community in crescendo from 1973 to 1980. Europe spoke incessantly for the “ legitimate inalienable rights of the Palestinians.” This phrase, borrowed from Arab League declarations, is repeated in every few lines of European statements mimicking their Arab models. We would seek in vain the definition of the rights of Kurds, Berbers, Copts or any other pre-Islamic indigenous inhabitants of the Middle East, including Jews- these peoples are never mentioned. The EAD committees imposed on Europe the cult of Palestinity based on the demonization and delegitimization of Israel, whose usurped history and identity are projected onto the Palestinians. 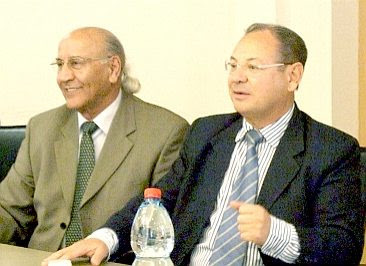 Traditional European Anti-Semitism and Islamic jihad are fused within the structures and geopolitics of Euro-Arabism; in this process, European anti-Americanism and Judeophobia come together within the Euro-Arab ideology. The Arab genocidal policy, which benefits from European Union support, guidance, and financing, is an international geostrategic force. Today we must abandon the usual framework of traditional Anti-Semitism and study Judeophobia in this new Euro-Arab context. It is quite simple: if one understands Eurabia and its provisions regarding the “Palestinian” question, and combines this with rudimentary knowledge of the relevant Quranic suras, then one is but a step away from understanding basic Israeli reality. There can be nothing but utter support for the Jewish state; nothing but utter support for Israel holding on to and defending land that is publicly and politically called the “West Bank”, what Israelis call Judea and Samaria. Without Judea and Samaria there is no military defense of the State of Israel. It is as simple as standing right there on a mountain overlooking the Jordan valley to realize that giving up Judea and Samaria is tantamount to committing national suicide, especially given the Muslim chant “Khaybar, Khaybar, oh Jews, the army of Muhammad will return”, referring to the expulsion of Jews by the Muslim armies from the oasis of Khaybar. It is precisely the half-knowledge of historical facts, the ignorance of realities on the ground, and myths that have been propagated since the inception of Eurabia more than twenty-five years ago that drive the critics of Israel to demonize it. A trip to Israel, such as the one I had the honor and privilege of being a part of earlier this month, dispels the ignorance very quickly. While even a cursory glance at a map of Israel should suffice, assessing the situation first-hand delivers the final blow to those unwilling to listen and to learn. 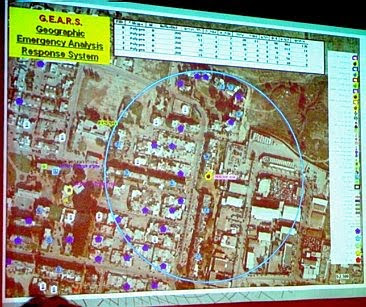 On 1—2 March 2008, rockets fired by Hamas from the Gaza Strip (some of them Grad rockets) hit Ashkelon, wounding seven, and causing property damage. Mayor Roni Mahatzri stated that “This is a state of war, I know no other definition for it. If it lasts a week or two, we can handle that, but we have no intention of allowing this to become part of our daily routine.” On May 12, 2008, a rocket fired from the northern Gazan city of Beit Lahiya hit a shopping mall in southern Ashkelon, causing significant structural damage. According to The Jerusalem Post, 4 people were seriously injured and 87 were treated for shock. 15 people suffered minor to moderate injuries as a result of the collapsed structure. 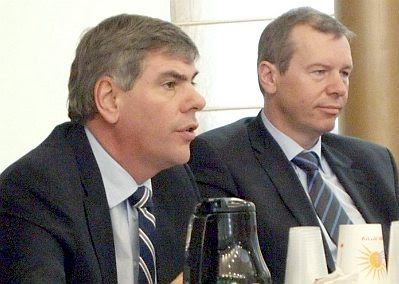 Southern District Police chief Uri Bar-Lev believed the Grad-model Katyusha rocket was manufactured in Iran. 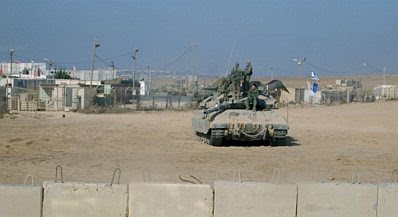 In March 2008, 230 buildings and 30 cars were damaged by rocket fire on Ashkelon. In July 2010, a Grad rocket hit a residential area in Ashkelon, damaging nearby cars and an apartment complex. Vienna during the hottest times of the Cold War. The Soviet troops who have garrisoned nearby Bratislava have decided to shell Vienna with rockets on a daily basis, targeting schools and hospitals, causing terror among the civilian population in addition to killing and wounding. The Austrian government, after 100 rockets have landed in Vienna and its vicinity, decides to retaliate, while the United Nations condemns the Austrian government and calls for restraint. I am an Austrian citizen whose daughter attends school. Would I allow for the UN to call restraint while the enemy, who incessantly calls for the total and utter destruction of my country, continues to terrorize me and my family? You decide. The mayor of Ashkelon, Benny Vaknin (below, with Eliezer “Cheetah” Cohen), invited us to City Hall, where we had the opportunity to introduce ourselves and the members of the delegation. 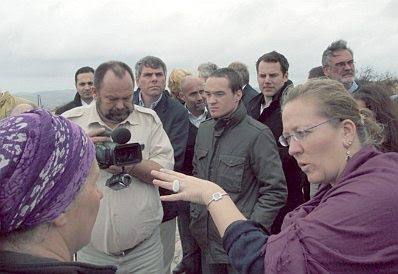 The delegation was also invited to tour the last Israeli military post close on the border of the Gaza Strip. Contrary to liberal belief, the Gaza Strip is no longer occupied by Israeli troops. Hamas, the rulers of Gaza, thank Israel for its withdrawal by sending rockets into the Israeli cities of Ashkelon and Ashdod. For Europeans like us who are not used to a military presence, it was very unusual to see soldiers like this young fellow manning the IDF military base. These 22-year-olds are considered the very best of their generation. Their demeanor shows awareness of the importance of their duty to defend their country. In essence, what these young people are doing day and night is defending us and our freedom. Instead of demonizing them, we should thank them. Perhaps one day, when we have lost this freedom, we will understand what it means to patrol in the desert, in the heat, in the dust, while we in the West rant about “evil Israel”. Shame on us and our politicians! Western Civilisation was founded on Judeo-Christianity. It was born near here, on the slopes of Mt Sinai where Moses received The Ten Commandments, and it is defended here, in Israel, the focal point of Islam’s attack upon the West. When we call for freedom and democracy, then by default, we stand with Israel. When we call for truth and honesty with regard to Islam, then we stand with Israel. When we call for bravery, determination and sacrifice in our struggle against Islam then we stand with Israel. When we call for the right to free speech and the right to a peaceful existence, then we stand with Israel. When we call upon God to help us defeat evil, then we stand with Israel. When we call out the traitors, the appeasers, the propagandists and the anti-Western haters within Europe’s political and media class, then again we stand with Israel. From just outside the Gaza Strip we headed north and found ourselves on a bullet-proof bus heading into what the unknowledgeable/Liberal/Left know as the West Bank, but what historians — Israelis and others — know as Judea and Samaria. The Western liberals who proclaim the area as “occupied” are known historically as the Useful Idiots. The City of Ariel, which did not exist in 1978, is now inhabited by Jews. And they inhabit it for a very good reason. Israel is only 70 km wide. From a mountain-top just outside Ariel, one can view with the naked eye Jordan on one side and the Mediterranean on the other. And through the valley that cuts through this mountainous region there are two roads. Just two roads. One road leads to Iran, via Iraq and Jordan. An armored column would come this way and this way only, so to control the hill tops around the area is a matter of geo-political importance. During the 1967 war, the Muslim Arabs installed “Long Tom” cannons on the mountain tops, from where they shelled the civilians living in Tel Aviv, a mere 45 KM away. When you next get involved in an argument with a liberal/leftist about the “occupied territories of the West Bank”, it might be a good time to point out the political/war realities. Islam wants the area back, because the Israelis would be rendered defenceless if they gave it up. Hence the concerted efforts of Islam and their Western useful idiots to do just that. “But land for peace is how we will achieve peace in Israel!” squeal the Western liberals. Tell that to the inhabitants of Sderot. Israel gave up Gaza and the peace loving “Palestinians” turned it into a terror state from which they could attack Israeli civilians. If Israel gave up the areas of Judea and Samaria, they would be wiped out within five years. […] I toured the area known as the Shomron with a delegation of politicians from Europe. What was unusual was that these people came and entered what their media calls the “Occupied West Bank” without fear of the personal political repercussions of doing this. Just crossing an imaginary line that lies 20 minutes drive from my house carries with it a huge political implication for many of these people back home. They will now be attacked and demonised even for making the trip: and doing it in the presence of the “Settlers” is as if they sat down and had lunch with devils. I met them [the delegation] at the entrance to the city (and it is a real city) of Ari’el. I have never driven there before but it’s only 30 minutes from my home (in optimum traffic) and it’s about 10 mins from the artificial border. And I live only 10 mins from the sea and can see the sea from my home. I joined the bus and immediately noted the armored glass. Nice. We had a guide who’d joined us on the bus, only later did I find out his interesting background. He told us of how we were following the ancient path that Abraham followed when he first entered the land of Israel. All the places along this road are mentioned in the bible. The ties of Judaism to the land just get stronger and stronger with every bend in the road. Our first stop was the community of Elon Moreh where we were joined by Sarah. She pointed out the community center in the little town, tragically named after a family of four, all of whom were shot to death in their home by a muslim terrorist in 2002. What a contrast: the Palestinian Authority name town squares after the terrorists who murder, the Israelis name them after the victims. 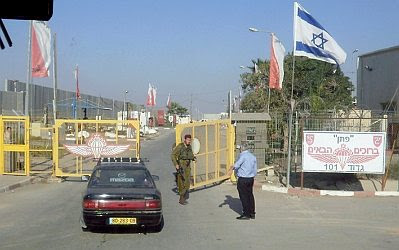 While we were driving through Judea and Samaria, I pondered the following: Why is it that kuffar (non-Muslims) are in need of bullet-proof buses to drive around an area that is inhabited by mostly Jews and some Arabs? Why is it that Arab-controlled towns are so obviously filthy, with garbage strewn around buildings and open spaces? Nowhere is this more obvious than in Judea and Samaria. Rolling through these Arab towns, we marveled at how these towns are identical to those we had previously seen in other Arab countries; there was absolutely no difference at all. The next predominantly Jewish town was, in stark contrast, clean, without any garbage lying in the streets or in front of garages. This has nothing to do with racism or hatred of “the other side”, as the professional Gutmenschen enjoy accusing those on the political right, but it is all about simple facts based on first-hand observation. Off the bus we stopped and listened to the story of archeological find of Joshua’s Alter as told by our guide, Sarah. This was simultaneously translated into German by Elisabeth Sabaditsch-Wolff. There’s a good version of the story she told online but one of the key points is that when excavated the only animal bones found were from kosher animals and specifically the sort described in Leviticus as being suitable for sacrifice. That would be an odd co-incidence if this land had not been inhabited by Jews. It’s hard to explain to people who don’t make this journey that when they read about “Settlements” and “Occupied West Bank”, there is such a stunning amount of history that binds Jews to this land and this land to the Jews. On any one trip you’ll only hear about an infinitesimal part of this! Contrast that with the modern Palestinians who have even taken their false name from the Romans and graced it with a starting letter “P” that doesn’t exist in Arabic! Most can’t even say Palestinian: it comes out as Faleshtina! Another important point that was made to us and was obvious standing on those hills. This is the very thin line that separates Israel’s population from death at the hands of it’s enemies. From these hills one can see all the way down to Tel Aviv and the sea. Artillery on these hills regularly shelled Tel Aviv and other parts of Israel when the land was occupied by Jordan. This land is a very precarious buffer. It’s been said before, you’ve read it before, but I want to convey to you the reality that strikes one when standing there. This is the reality that these politicians from Europe will have felt, they all “got it”. In addition something else is clear when driving through these lands. All the Arab villages are built on the valley floors. All the Israeli towns are on the tops of the hills. This makes for some bleak and rather tricky building conditions, but obviously this is a military imperative. But it also puts to bed the lie that land or property is taken from Arabs and given to Jewish settlements. Its also abundantly clear that the land is very sparsely occupied with or without Jews. The previous day I’d met up with the group in Ashkelon in the morning. That afternoon they toured the Gaza border and visited Sderot while I took a train back to Tel Aviv to hear Geert Wilders speak along with Aryeh Eldad. I’d sat with Filip Dewinter and his colleagues from Vlaams Belang and enjoyed a particularly fine piece of fish (good enough for Jehova I dare say!). We talked about the benefits to Israel of immigration and how amazing Israel has been at absorbing its Jewish immigrants. From the survivors of the death camps, through the refugees who fled Arab countries after 1948 and to the massive 1 million Russian Jews who joined the country in roughly 10 years. 20% population absorption in 10 years is unprecedented and barely mentioned. It’s nonsense to talk about anti-immigration. It’s the unspoken truth that some immigrants into some countries are better than others. The right sort of immigrants can always be taken. 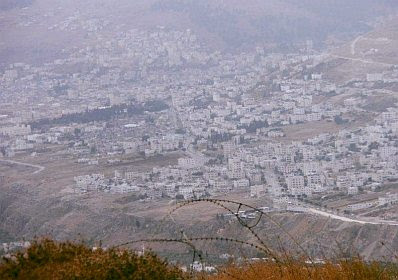 One of the most disputed cities in the so-called West Bank is Ariel, which is considered a settlement in the eyes of the international community, i.e. the United Nations, and by extension the Organization of the Islamic Conference. However, Ariel is definitely not a settlement, but a full-fledged city boasting a university center with more than 12,000 students, of whom a mere 500 are Arab. According to Wikipedia, in January 2010, Benjamin Netanyahu declared Ariel the “capital of Samaria”, and an integral part of Israel. Following a tour of the university center, we were invited to meet the mayor of Ariel, Ron Nachman, who is also the city’s founder. Despite his severe illness, he met us in the highly contentious Ariel Center for Performing Arts, where he explained the historical background and strategic importance of the city. We returned to Ari’el where we visited the 12,000 student University. This is not a small University and it’s not temporary. Get used to it being there. It also has at least 500 Arab students and, unlike Bersheva University for example, these are not mostly Beduin. These are Arabs from Judea and Samaria: they’re not enforcing a boycott on the “settlement” of Ari’el. While there we looked out on a massive blot on the face of Israel. It is the temporary homes that house some of the Jews evicted from their homes in Gaza. These people are still living in temporary structures: they’d been all set to begin building new homes when Obama’s crazy building freeze came into force. One can only hope that their horrendous treatment by the Israeli government will get better soon with proper compensation for the beautiful homes they were dragged from by the Jewish army. For a pointless dream of a peace that never came from a fanatically religious foe that knows not how to say thank you. The last part of the day was a much delayed meeting with the Mayor of Ari’el. More than anyone else he is responsible for founding this amazing city which is the hub of the Shomron. He is an avowed right winger and a firm fixture in Likud. He is also fighting cancer and he pulled himself out to come and visit this group. All in all some 300,000 Israelis now live in Judea and Samaria. They don’t live in tents. It is time to come to terms with the need for Israel to be able to defend itself and the ties of the Jewish people to this land. I must admit I didn’t fully understand all this and, as usual, there is no substitute for getting boots on the ground and eyes on the. And if the experienced changed me, perhaps it helps to bring people here: no matter what your preconceptions about them. That evening found a small group of politicians and members of the Counterjihad in Jerusalem, where we toured the Old City. I will report on this separately. The last day of our official program included visits at Yad Vashem and the Knesset, the seat of the Israeli parliament. Yad Vashem is without any doubt in of most touching places I have visited. One cannot help but feel utterly helpless when walking through the hall of the museum, where the horrors of the Holocaust are so vividly depicted. 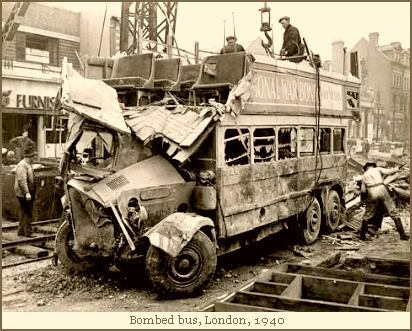 And as it is impossible to describe the horrors, I will only say that the members of the Counterjihad were even more resolved that “Never again” must mean “Never again”. is a massive 2.5 acre monument literally dug out of natural bedrock. Over 5000 names of communities are engraved on the stone walls in the Valley of the Communities. Each name recalls a Jewish community which existed for hundreds of years; for the inhabitants, each community constituted an entire world. Today, in most cases, nothing remains but the name. The Valley was excavated out of the earth-nothing was built above ground. It is as if what had been built up on the surface of the earth over the course of a millennium-a thousand years of Jewish communal life- was suddenly swallowed up The names of the communities are engraved on the 107 walls which roughly corresponds to the geographic arrangement of the map of Europe and North Africa. The names of the communities are engraved and commemorated on the walls in the Valley for future generations who will identify with the memories and find their roots. I welcomed the short drive from Yad Vashem to the Knesset as it provided me with the opportunity to gather my thoughts and reflect on the gut-wrenching images I saw. Knowing what I do about the content of the Quran with respect to the treatment of Jews as well as Adolf Hitler’s admiration of Islam, I resolved once again never to give up and never to give in. The security procedures at the Knesset were tight. We had had to forward our passport details ahead of time, and only those who had done so were admitted. One member of our group who was not on the list had to stay behind. 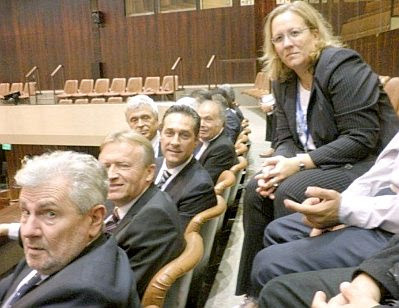 We were first taken to the plenary hall, where the members of the Knesset were already in session, and were seated in the VIP section of the visitors’ gallery, not separated by presumably bullet-proof glass. The plenary itself was nearly empty because of the Hanukkah celebrations; still, votes were taken on road measures. The Austrian MSM as well as the political Left (including official Austrian Jewry) have been unable to deal with Strache’s trip to Israel. 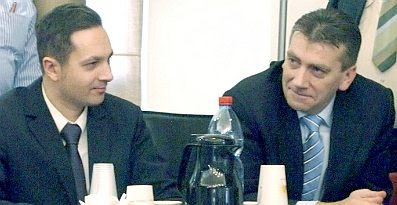 Ariel Muzicant, the president of the Austrian Jewish community, has gone so far as to ask the Israeli ambassador to Austria for assurances that no Israeli politician meet with Strache and his delegation. Muzicant now has a problem: Not just a politician met him, but several, and he was also received by a close confidante of prime minister Benyamin Netanyahu, deputy minister Ayoub Kara. 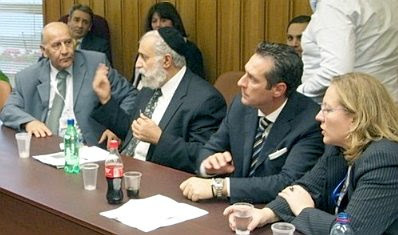 In the Knesset the delegations held discussions with a prominent member of the Shas party, Rabbi Zeev, and met with Giora Fortis, the former military adviser to Israeli president Chaim Herzog, now press officer of the Knesset. A visit to the small museum honoring Gush Katif, a former Israeli settlement in the Gaza Strip, ended the 100-hour-long visit to Israel. Paul Weston and I were able to deliver our speeches, interrupted only by the arrival of Deputy Minister for Development of the Negev and Galilee, Ayoub Kara, who gave a short speech in which he supported the new European Right. Three weeks after my return, it is still too soon to form a definitive conclusion about this trip to Israel. The MSM and the Leftist liberals have been busy in condemnation, but this is almost understandable, given that the new European Right is changing the paradigm for dealing with the Middle East. I believe the trip was a success for everyone: the Israelis, who were able to explain the nature of Israel’s security problems; the new European Right, who were successful in demonstrating that being on the political right does not mean being anti-Semitic; and, finally, the European Counterjihad, who were able to make important contacts on all sides, and who showed that they too have something to say. The European Counterjihad made a huge impression on the Israeli and European politicians. more of these conferences are planned in the coming years, and it is absolutely crucial that they all take place with the European Counterjihad’s involvement. The making of the series reminded her of the aftermath of the Holocaust today; she describes it as “very painful”. “Drottningoffret” is the third in a series of programs that are being produced based on Hanne Vibeke Holst novels. Publicity remains an uphill battle. It is clear: in the media no one is waiting for us. Immigration is no longer an issue, as the people who matter have decided. Here and there still are some minor issues, but they are being resolved. We are actually sort of a vestige of something that is no longer is an issue. So they find. We’d better go for it a little harder. My computer becomes a “stalinorgel” [nickname for a multiple rocket launcher — translator] with which I launch a barrage of press messages into the world. A day without parliamentary questions is a day wasted. With the question: “Will you then maybe want that as an exclusive?” I try to increase their value to journalists. By about now I have a list with hundreds of mailing addresses to hundreds of journalists, media, columnists, and anyone who might be interested. They are being kept informed of everything we do. Columnist Rob Hoogland one day writes in the newspaper De Telegraaf that we rage as Jehovahs. I view it as a compliment. But first, on March 2 next year, there will be the provincial elections in the Netherlands, which will lead to a new Senate. Wilders is hoping for ten to fifteen seats in the 100 seat 75-seat Senate. He does not yet know who will become PVV fraction leader there. Wilders is convinced that the PVV is not a temporary movement, as CDA [Christian Democrat] Defense Minister Hans Hillen said in a recent interview. Wilders: “The Party for Freedom is much more than Geert Wilders alone. If tomorrow something would happen to me, I do not think the party would collapse. More and more people will hear the voice of the PVV. We are going to put an even bigger stamp on the Netherlands. It has encouraged conquest, wars, slavery, countless persecutions and murders, and genocides like the Armenian one and today’s systematic attempts to annihilate religious minorities. 14 centuries of efforts to enforce Sharia law on mankind have carved a bloody scar in human history. Any promotion or spreading, directly or indirectly, of Sharia law make those who commit it are accomplices to religious incitement to hatred and violence on a worldwide scale and thus accomplices of a crime against humanity. This must be known, this must be said. 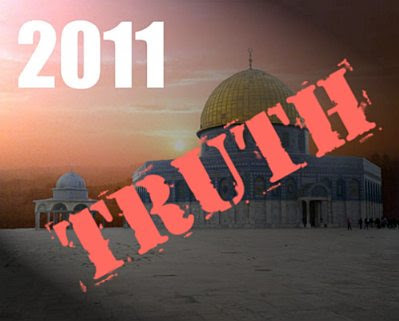 We declare 2011 to be the International Year of Truth About Islam. Go over to ICLA to read the same text in French. In other words: The United States ambassador considered the “absolute primacy of free speech” to be a NEGATIVE. The Danish government believes in freedom of the press more than our own government does. Gud bevare Danmark — May God preserve Denmark! Remember: all of this occurred on the watch of President George W. Bush, the man who said the United States was the “friend of all those who love freedom”. The same guy who sent our soldiers all over the world to die for “freedom”. One of the big mistakes being made by American conservatives nowadays is to believe that the Republicans are substantively different on this sort of issue than the Democrats. They aren’t. That’s why I experience a certain loathing when I read magazines and look at websites that act as partisan cheerleaders for the Republicans at all times, no matter what. Whatever helps Republicans win elections is good. Whatever hurts their chances is bad. Yes, yes: I know the Republicans favor higher defense spending. But they use all that military power to serve the purposes of the Saudis and the Emirates. If we ever take out Iran’s nuclear capability, it will not be to “advance the cause of human freedom”, but to eliminate a rival and threat to Saudi Arabia. Petrodollars speak louder than the electorate. It’s as simple as that. The mainstream Republicans are on board with all this. 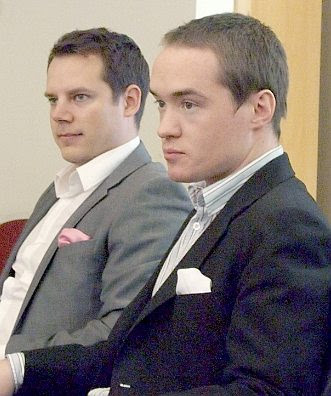 They’re appalling. They’re disgusting. And yes, the Democrats are worse, but the Republicans pretend to stand on principle — and so they should. As it stands now, they are masters of the Big Lie. If the opinion of its ambassador to Denmark is any indication, the United States of America believes that the best way to prevent terrorism is not to target the source, but to restrict the speech of those who offend Muslims. Whether they realize it or not, America’s policymakers are actually promoting sharia. Under Islamic law, insulting the prophet Mohammed — which is what Muslims charge the Mohammed cartoonists with — is considered “slander” or “defamation”, and is a capital crime. For the past eleven years, the Organization of the Islamic Conference has been attempting to push through a UN resolution that would impose exactly this definition of “defamation of religion” on the laws of all member states. The United States is ahead of the curve here, acting — if you can believe it — in advance of the United Nations. Through its diplomats abroad, it is pushing for the Islamic definition of slander in Western democracies. The question that naturally arises is: how many newspapers and magazines in the USA experienced the same pressure? How many editors received a discreet telephone call from the Department of Homeland Security or the State Department? We’ll never know the answer to that one, of course. Any words that passed between the federal government and the Fourth Estate will remain obscure. But one word we should be dusting off and putting into use is the dreaded T-word: TREASON. Julian Assange may be a cynical opportunistic amoral lowlife. He may well deserve to go to prison for stealing classified state secrets or some similar offense. Some Republicans want to try him for espionage, and those who overlook his Australian citizenship would like to try him for treason. Oh, yes — I could definitely suggest a few names to put at the top of the list in a comprehensive indictment for treason. But “Julian Assange” wouldn’t be one of them.